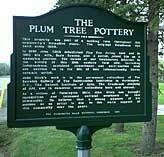 Located in Farmington Hills, Michigan, USA, Plum Tree Pottery (closed as of summer 2016) has been a private studio space since 1965. For those familiar with my work, as well as those for whom it is new, this website will offer a changing selection of images and text materials to keep pace with new directions in my work, with upcoming exhibitions, and with events here at Plum Tree Pottery. Please try to visit Plum Tree Pottery to see the studio, showroom, and gallery spaces. The potter who finds life in his work finds it daily in small glimpses, and perhaps these are the successes as much as anything. For example, shapes evolve guided by forces apparently outside my control. This is instinct, intellect and openness to change fusing, into what I think is the most positive force behind any potter's approach: evolution or growth. Some call it inspiration. I cannot show one piece and say "this speaks for my beliefs in clay." I am attracted to simplicity, as well as complexity: my work continually reflects my re-examination of how these two poles can coexist... or not, in a given series. Over the last fifty years two significant elements have made for a happy adventure in my work. The first element is my very great love of process. You could say I am hopelessly in love with bits and pieces of the making of pots. It is not enough to merely throw a particular form, I must make that certain throwing rib that adds a special, unique touch, or develop an entire "world" of extrusion dies, all of which are lovingly used over time, only to discover that I have physically outgrown my manual extruders and must design and build not one, but two hydraulic extruders which then greatly expand my working potential. This is love of process! The second element is the ability to ask questions of myself, to demand that inquiry be a part of studio life. Sound simplistic? Maybe not. Without that little nudging foot in the backside, one might be a bit tempted to remain too stationary in attitude and therefore in pots. So it is that the notion of the "question" has become integral to my daily thinking about studio activity. Is it to give a whole phase of work a rest? Is it time to introduce another orientation to thinking about what I will make? Recently I have been making rather pictorial, landscape oriented wall panels as well as pots. A bit of a shock at first but actually a very welcome "irritant" that has propelled and informed all phases of my work. When we are alone with our innermost thoughts about why it is we need to make things from clay we will hopefully come to know a private truth that tells each of us a very personal answer, woven of the same threads of mystery that has captured the spirits of artists through times past.